Sali Herman was a Swiss-born Australian artist and one of Australia’s official war artists for the Second World War. Sali Herman CMG (12 February 1898 – 3 April 1993) was a Swiss-born Australian artist, one of Australia’s official war artists for the Second World War. Sali Herman was born in Zurich, Switzerland on 12 February 1898 of Polish parents. He studied at Zurich Technical School 1916-18 and became an art dealer travelling extensively in Europe, Africa and South America, before arriving in Melbourne in 1937. He studied art under George Bell in 1937 and moved to Sydney in 1938. During the second world war he joined the AIF in 1941, serving in the camouflage section, then with the 3rd Royal Australian Engineers, and in 1945 as an official war artist. 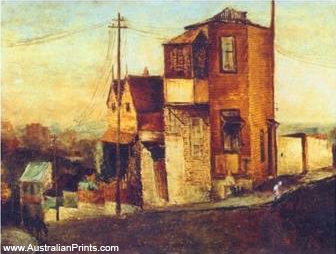 He painted landscapes, still life and portraiture, but became known for his streetscapes of Sydney which caused controversy in the 1940s when angry detractors dubbed them `slumscapes’. His paintings convey the particular joy and magic Herman found in his immediate surroundings. He died in Sydney on 3 April 1993, aged 95. Artist information page for Sali Herman. This article uses material from the Wikipedia article Sali Herman, which is released under the Creative Commons Attribution-Share-Alike License 3.0.